"A lighter version of the traditional dessert. Also yummy served over pancakes instead of syrup." Heat butter, brown sugar, and orange juice in a skillet over medium heat. Once the butter has melted, add the banana. Cook until the banana has softened and the sauce is slightly syrupy, flipping the banana occasionally, about 2 minutes. 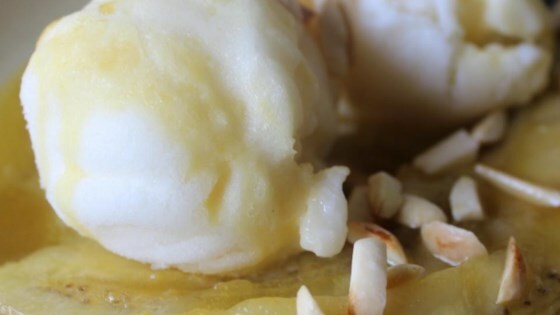 Serve each slice of banana with a scoop of vanilla ice cream. Drizzle with the sauce and sprinkle with almond slices. I scoop my ice cream into a plastic container, then place into freezer so it stays frozen. Put scoops into serving dishes once bananas are cooked. Optional sliced almonds should be toasted. I really like how there is no banana liquer.. I always wanted to make a banana foster, but I never had it! Thanks for such a delicious recipe! Made this for the Recipe Group. We thought this was just amazing, especially for how easy it is!! We were licking our plates :) Definitely will be making this one often! This "Skinny Foster" dessert is a top-notch gourmet treat! It is super fast and easy to make to boot! Thank you PAMELA D. aPROpos of nothing for sharing your recipe.